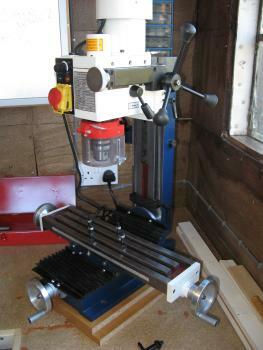 I’ve been looking for a milling machine for some time and have been surfing the web. This can drive you insane as their are a number of machines on offer, some just a variation on a theme with a common source based in China (Real Bull Machine Tool Company realbull-machine.com). I narrowed my choice down to Warco or Amadeal and after being messed around by Warco went for the Amadeal XJ12-300 this is a Real Bull XJ9512. I paid £412 plus carriage at £45 so a total of £457 and it arrived a few days later in a wooden crate. The delivery man was not so polite about the weight of the machine, the crate ended up dumped on the front drive. It was a case of taking the crate apart and then dismantling the machine so that I could lift the parts through to my workshop. So this is the machine after I cleaned it up. Whilst it was in pieces I took the cross-slides off, covered them in Gunk and cleaned all of the parts. OK, I’ve mounted it on two pieces of chipboard to raise it off the bench and to get clearance for the cross-slide handle. At the moment the chuck guard is still in place, but must admit that this is something I will probably remove – well, a few years on now and the guard has gone. There is a vertical fine feed with a graduation of 0.6mm per revolution (a bit strange and painful, but could be worse). 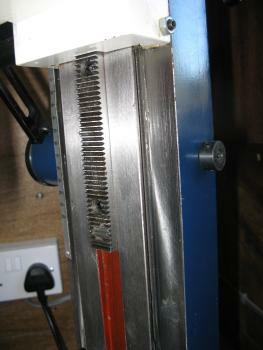 The main vertical travel moves the complete head up and down the slide with a rack and pinion. As you can see in a later image there is a spring assist for the main head vertical travel. 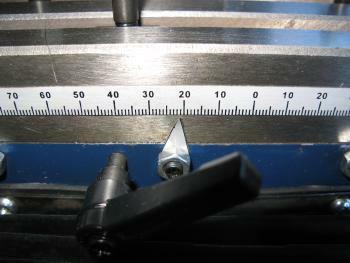 The longitudinal and cross-slides have leadscrews with 0.75mm pitch – again a pain, but will resort to a multiplication table pinned up on the workshop wall. WRONG: Oh how wrong I was…..I’ve now used the mill in anger and the leadscrew is 1.5mm pitch, the dials are graduated 0.75mm per rev – incorrect, but the minor graduations are shown as 0.02mm/division which is correct. Oh what a mess. My first thoughts were to find new dials, however, the easiest way is to remove the numbers and re-mark them correctly. Later I think I might change the leadscrew or just attached digital readouts. Note: Have just fitted a digital readout to the Z-axis – read Mini Mill Digital Readout. There is a rule and marker fixed to the slides. A useful addition if a tad flimsy. 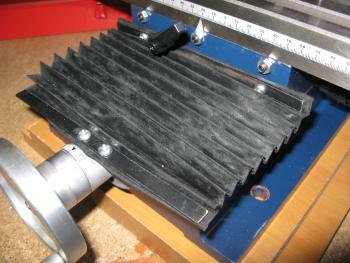 Rubber bellows cover the leadscrew and cross slide. They are simple to remove to get access to the leadscrew for cleaning and oiling and do an effective job of keeping it clean. 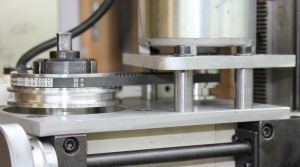 We have been contacted about XY axis accuracy issues and so have written a page about measuring it – Mill X Y Axis Accuracy Check. The milling machine as reviewed here is out by 0.1mm in 100mm. Not too big a concern, but does depend on what you are trying to achieve. The whole vertical pillar can be tilted over +45° or -45° – the downside is that this results in a less stiff pillar. 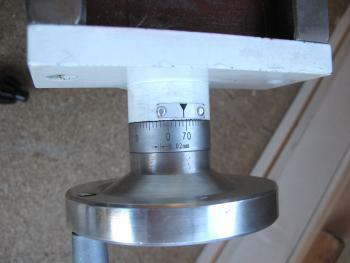 There is a locating bolt to get the head in the upright position, but the head does need some fine adjustment to ensure an accurate 90° to the bedplate. 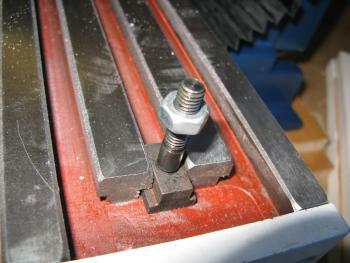 The fixing nut is large, however, a large spanner is provided in the toolbox. There is a reasonable simple way to set the column up vertical – Mill Vertical Setup. The complete head is wound up and down the slides with a rack and pinion. This works very well as the effort is quite well balanced with the spring assist. Reading other reviews of similar machines there are options out there to replace this sping assist with a gas strut assist – will look into this and provide some links here in the future. Note: this has now got the better of me and I have fitted a gas strut – read Mini Mill Gas Strut. 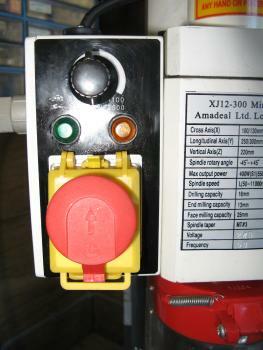 A stop start button is provide under this large emergency stop button, a bit clunky, but appears to be the norm on a lot of the lower cost machinery. 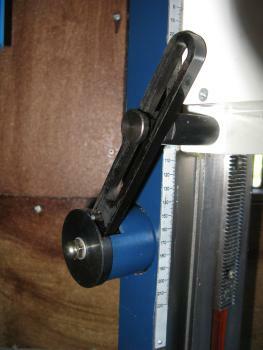 The speed is varied by twisting the knob, however, there is no feedback as to what speed the spindle is rotating at. A shift between high and low range can be made once the machine has stopped and is done using a lever located under the fine feed. I must say that on initial use the gear noise is quite severe – again something to look into. The milling machine is quite old now (February 2015) and has been heavily modified. 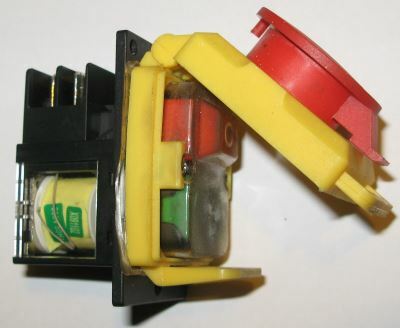 The start switch is not latching, appears a problem with NVR switches when they get dirt in them. Just had a conversation with Amadeal and they can order me a new part KJD12 – a 16A NVR switch. The new NVR switch arrived very promptly from Amadeal, swapped it over and problem solved. This shows the old switch, note the coil behind the start button that holds the contacts in place whilst a current is supplied to the coil. 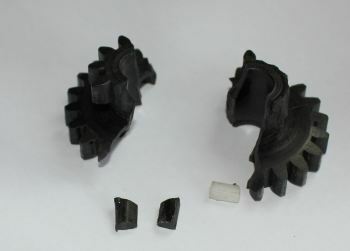 The drawbar is accessed by removing the plastic cap on the head. Again a spanner is provided for completeness. Have just bought some 3MT direct collets and will report on those in a separate page as they do transform milling as they significantly increase the stiffness of the mill – Collets. Four 12mm T-nuts are provided. One problem with the free T-nuts is they are very weak and of the 4 provided 3 have cracked – best to treat yourself to a proper clamping set. I have since been using a clamping set and have not had a single problem with any of the nuts, so must assume that the ones supplied with the machine are just rubbish. Sturdy construction and sized just about right for most model making requirements. The odd divisions on the traverse, cross-slide and vertical adjust are a pain that I might just have to sort out as they may drive me mad. The noise from the back gears may drive get on my nerves as well. 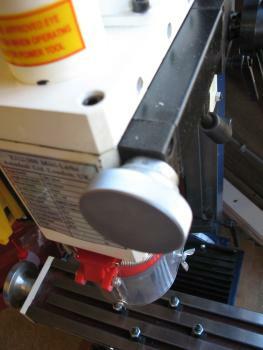 I′ve previously been using a Unimat 3 with a mill attachment, a great machine if you are gentle and take your time. However, you really do need to take your time as cuts have to be quite small to reduce the chatter. This machine is capable of taking much larger cuts with no complaints and that is quite rewarding. All in all though you really cannot complain for this price and I’m sure I will be using this for years to come. The service from Amadeal is superb. I will update this page with any changes, hints or tips. 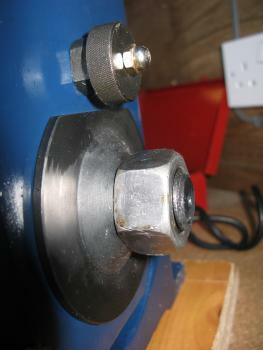 Gearbox Problems – Had been using this mill now for around 2 years and although rather noisy has worked rather well. I pushed it rather hard today and it stopped. Well the chuck stopped rotating but the motor was still spinning….so I′ve written a page describing a solution: Mini Mill Gearbox Problems. 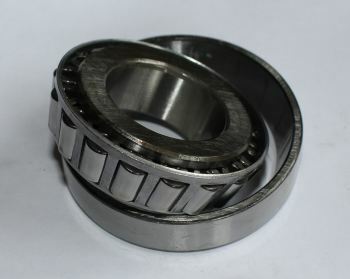 Roller Bearings – Tapered roller bearings transform the mini mill, reducing any play, reducing runout and making for a quieter running milling machine. 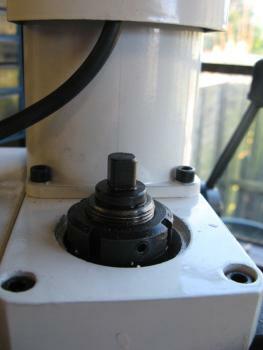 Gas Strut – The spring that lifts the head of the milling machine was annoying me for some time. One big issue is the force is not consistent. However, it looked like a big job and so I have ignored it and carried on with the important job of model making. 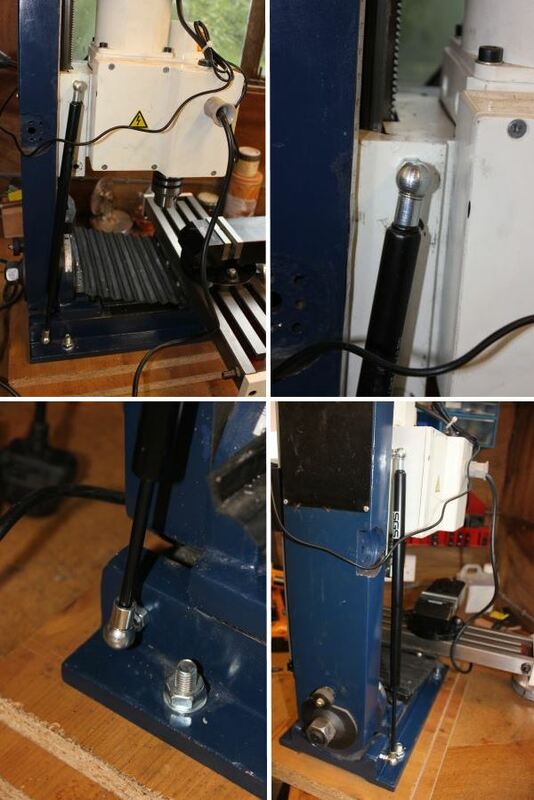 Then I bit the bullet and converted to a gas strut – wow, stop the model making and do this conversion as it will give you a better milling machine. 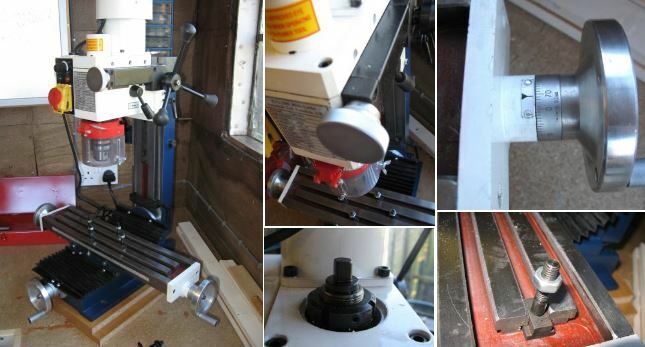 Belt Drive for the Mini Mill – this is the conversion that you have to do if you own one of these mini milling machines. The machine is then quieter, smoother and a delight to use. 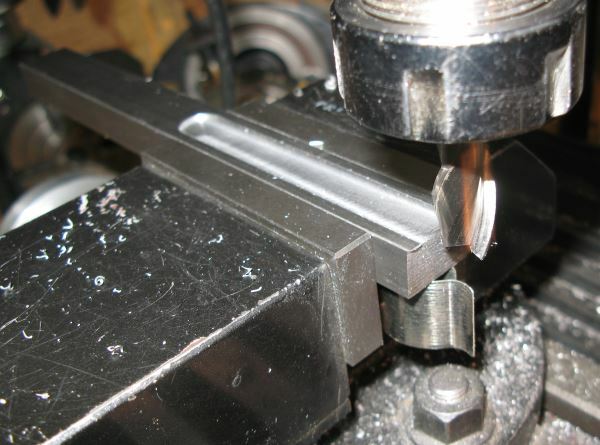 Milling I-beams for a new gas engine. The belt drive leads to a much more refined experience, not sure I would have tackled this job with the original geared system. Hi Nigel, I have to say, the page(s) you have published here are an absolute goldmine of genuine advice and information. I bought this exact same mill last year near Boston, MA, and i haven’t found someone with the same one, until now. I have been researching and researching, and I cant wait to keep reading your publishing here. They’re well detailed and easy to read. Thanks for sharing.